Would you eat anything bearing any resemblance to “Soylent Green?” Perhaps the majority of people are now too young to know what that is. I haven’t ever seen the movie, but I am still aware that “soylent green” refers to a food made of human flesh. It’s a pretty gross connotation. 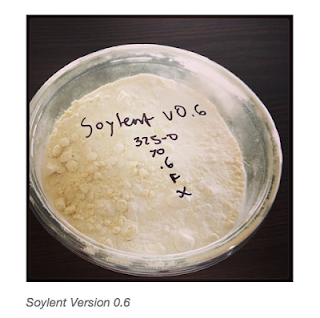 Thus naming a new food product “Soylent?” I would say that’s beyond ludicrous. Hold on…. Who are these people? Is this a boring liquid food substitute for depressed people? The only time in my life I can recall ever being disinclined to eat was when I was really depressed. Don’t most people want to eat? You’re SO busy you can’t eat an apple? Or a power bar? Or a Snickers? You’d rather have a tasteless beige liquid? I mean, Pedialyte sounds better than that. Hell, I think I’d rather drink Ensure. Supposedly, it will also cost you $65 a week. That’s pretty expensive flavorless food. On their website they reference all the waste created from eating and that many people die each year from the smoke inhaled from indoor cooking stoves. I find it hard to believe that a sort of expensive tasteless drink is going to fix these problems. NOR DO I WANT IT TO. Okay, maybe I don’t want people to die of smoke inhalation. And I don’t want people to waste food. I do, however, want to eat food. I want to eat food that tastes like food. And if that means there’s going to be trash associated with it, well then tough. If I have to throw out some plastic so that I can eat a Ritter Sport chocolate bar with hazelnuts, I’m throwing out the plastic. It's Fashion Friday! : Focus! You Need Shorts! Over a decade ago I decided to go to school to get a degree in classical music performance, having no idea what the future economy held. This resulted in the addition to the population of another struggling artist. I play music, I take photographs, I write, and I make things. I love fashion and functional art. I believe that ignorance is a choice. And I think people need to laugh a little bit more. Profile photo copyright Addie Roberge Photography. Background photo copyright Sarah Botham. Picture Window theme. Powered by Blogger.